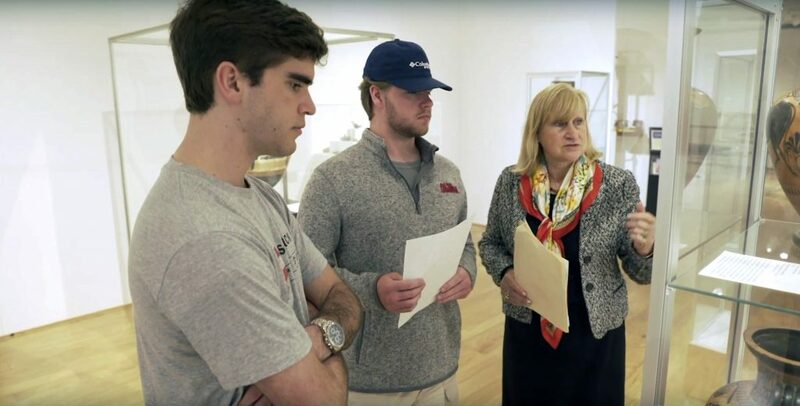 Learn about what it's like to major in Classics at the University of Mississippi. 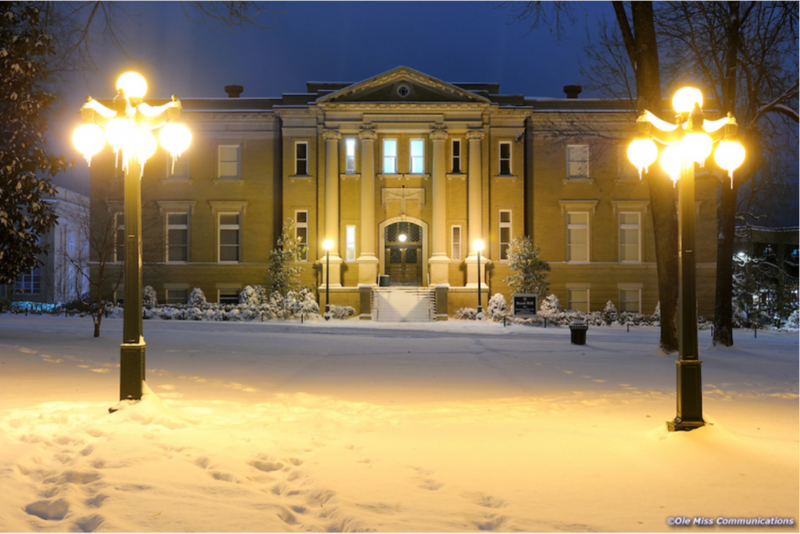 Constructed in 1911, the building is the home of the Department of Classics. 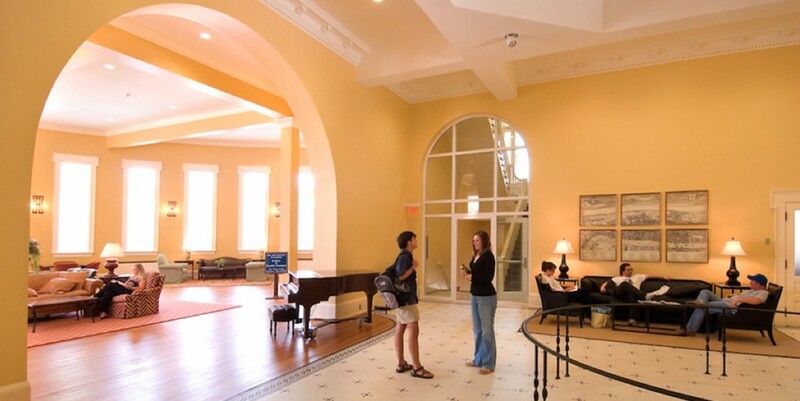 The lobby of Bryant Hall provides quiet study space for Classics students. 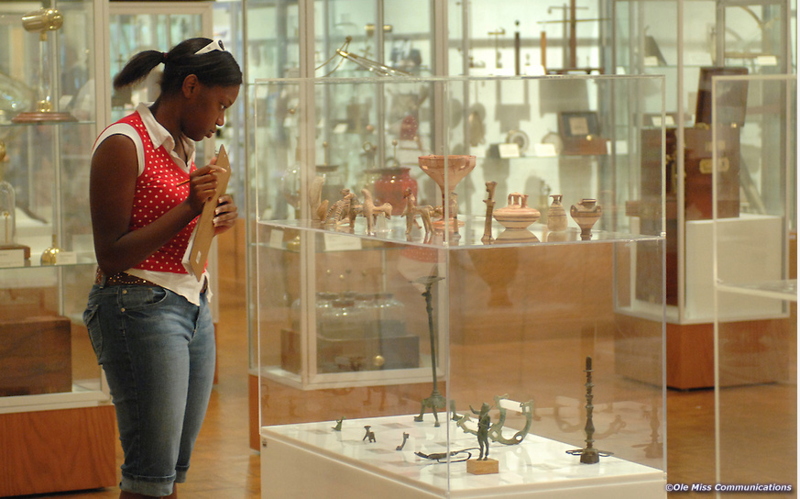 Considered the best of its kind in the South, the University Museum's antiquities collection is available to students for study and research. 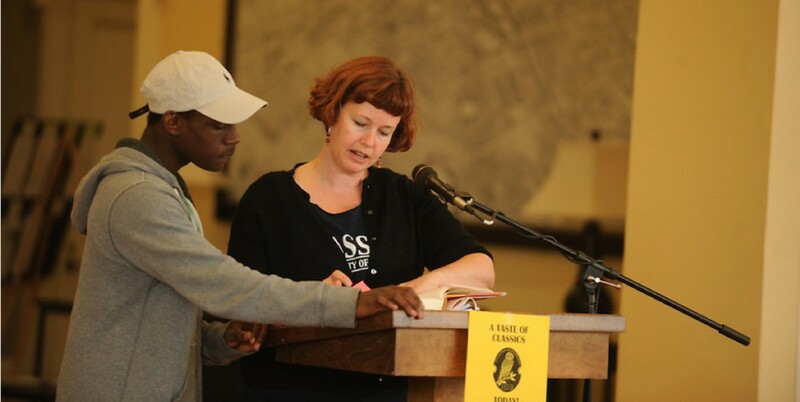 Dr. Molly Pasco-Pranger helps a student get started at A Taste of Classics, a public reading of Greek and Roman literature held twice a year. 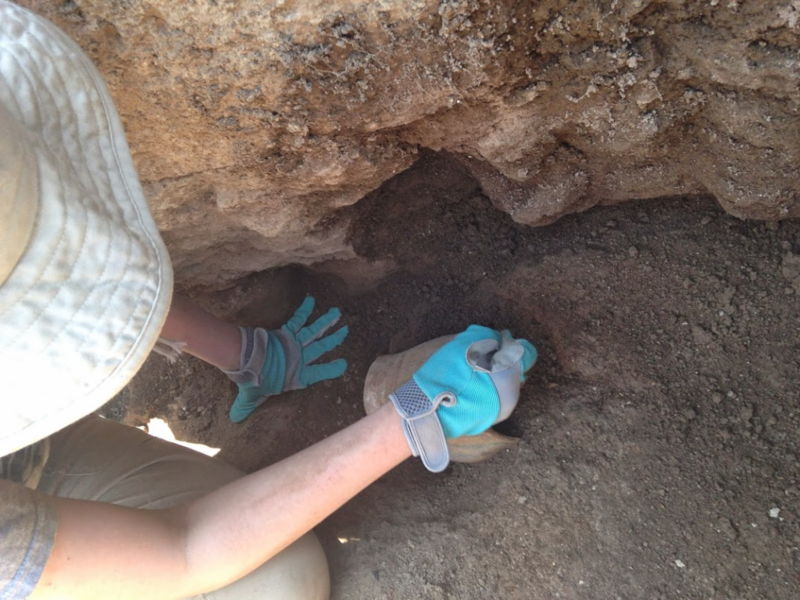 The Department helps students participate in archaeological digs around the Mediterranean. Dean Richard Forgette awards Dr. Hilary Becker the 2015 Cora Lee Graham Award for Outstanding Teaching of Freshmen. 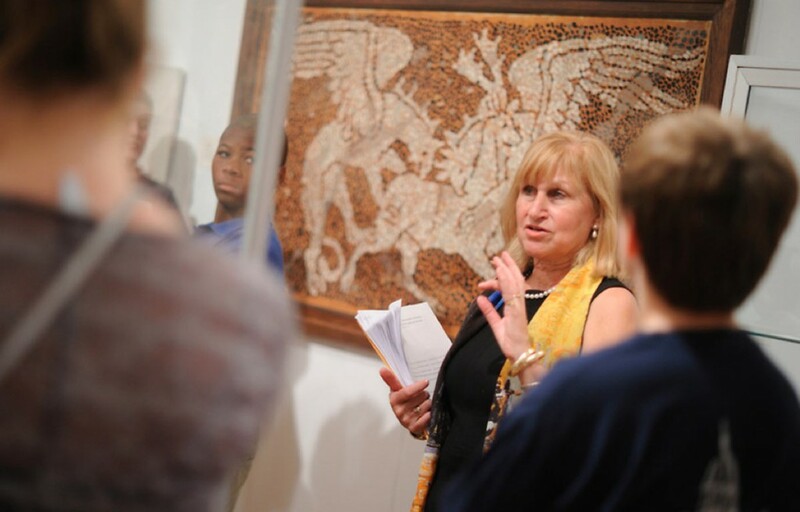 Dr. Aileen Ajootian leads visiting high school students on a tour of the University Museum. 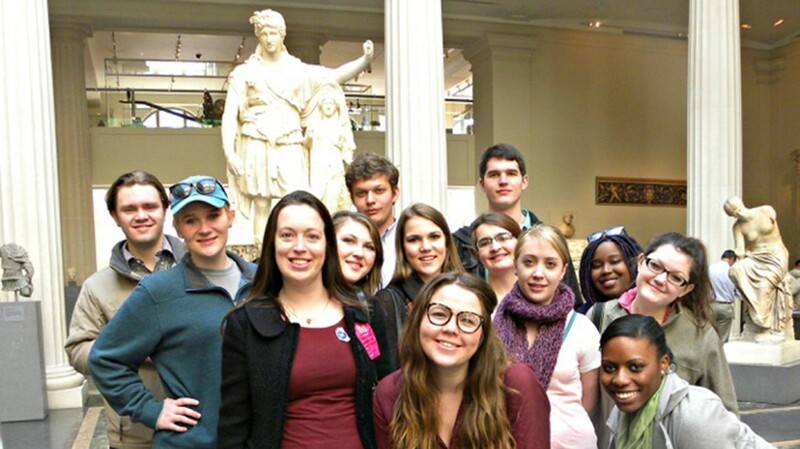 Dr. Hilary Becker's Spring 2015 course in archaeological ethics included a trip to New York where students met with museum and auction house professionals. 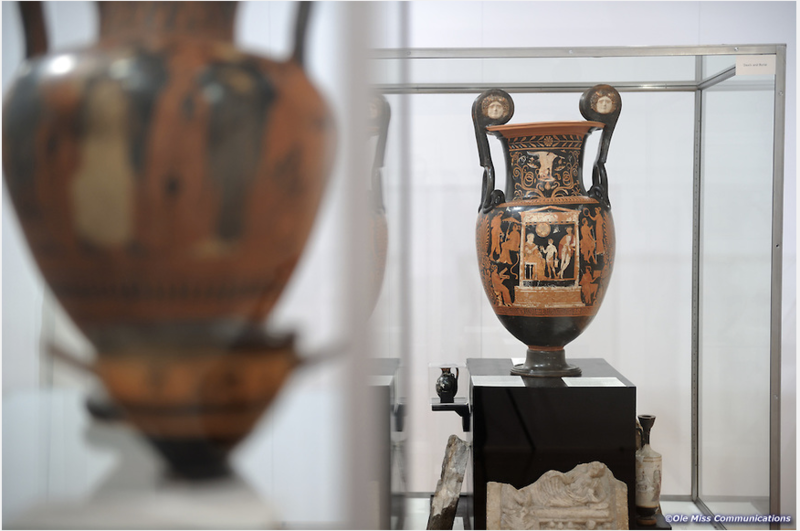 The Museum's extensive ancient coin collection is a resource for many courses in Classics. 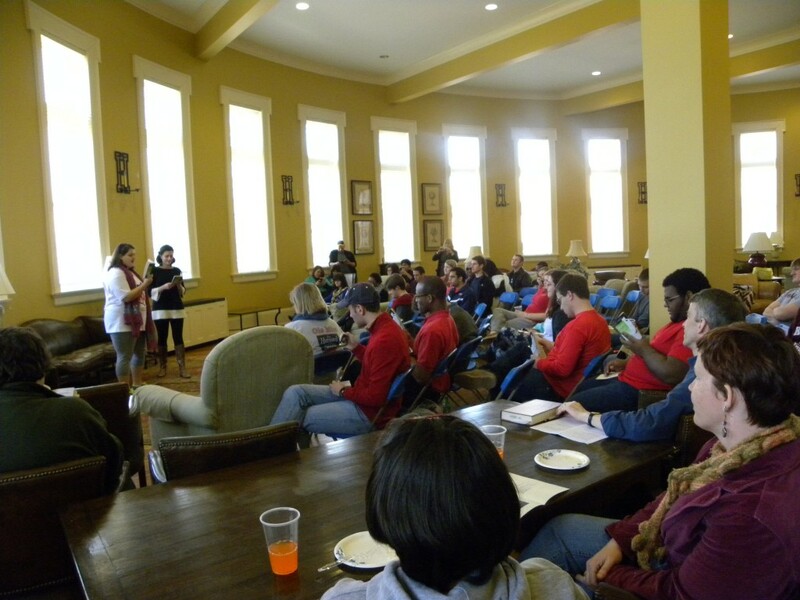 Students perform a staged reading of Aristophanes' Lysistrata in Bryant Hall's Farrington Gallery. Drs. 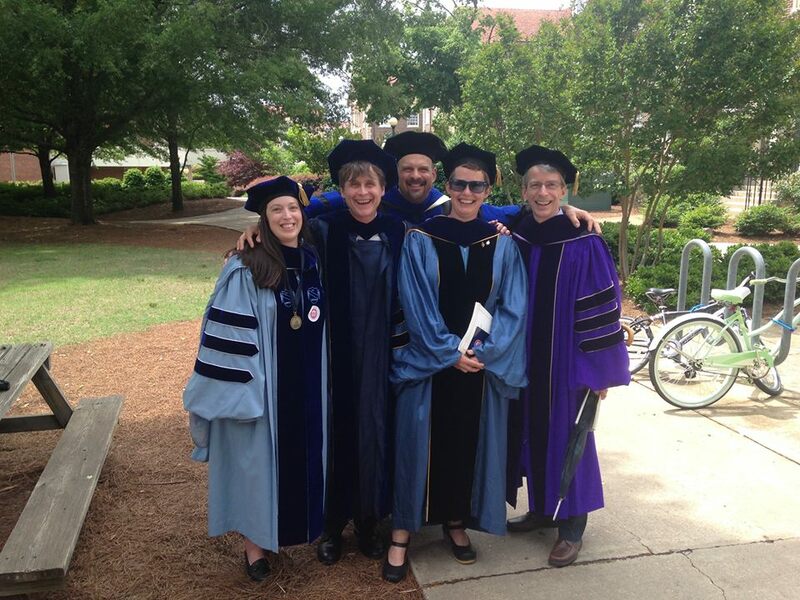 Becker, Fenno, Lobur, Pasco-Pranger, and Cook, in full plumage. 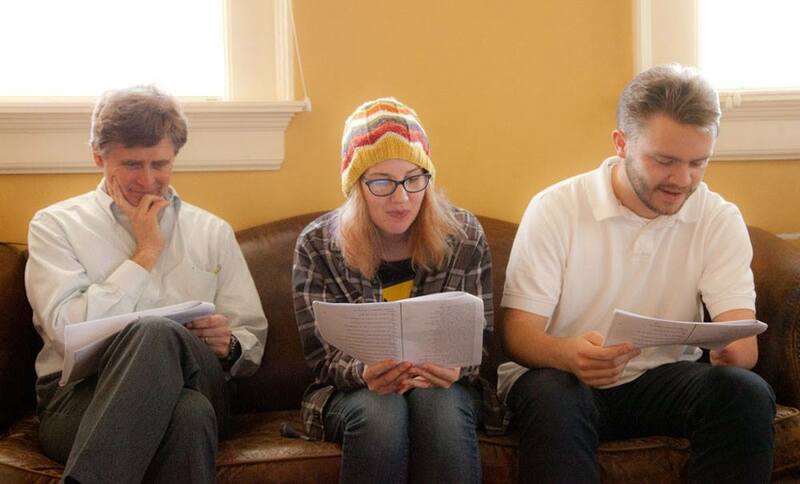 Dr. Jonathan Fenno and Classics majors Sharon Possehl and Hal Moyer participate in a live reading of Sophocles' Ajax. 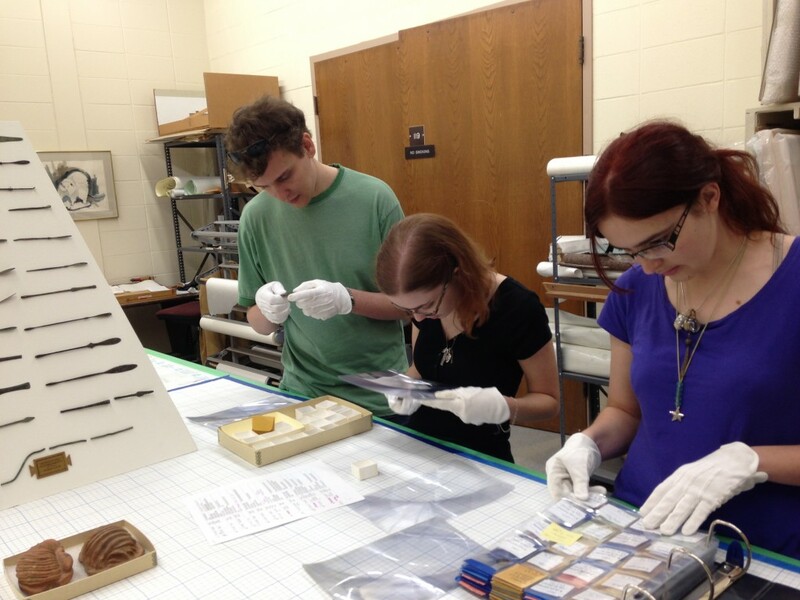 Dr. Lucy Turnbull works with a student on an item from the Robinson Collection in 1971. 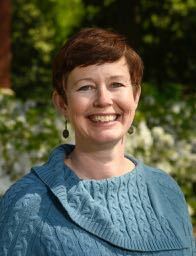 We received the sad news Sunday, April 21 of the death of our emerita colleague, Dr. Lucy Turnbull. 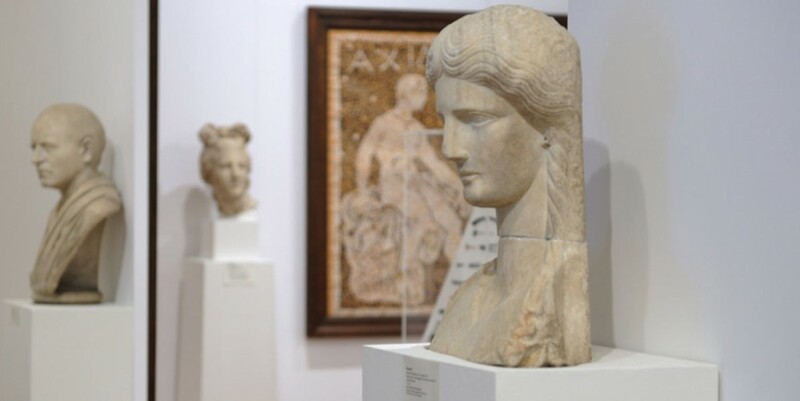 Dr. Turnbull joined the University of Mississippi faculty in 1961, teaching classical art history, archaeology, mythology, and civilization and also working to catalogue and curate the recently acquired David M. Robinson Collection of Greek and Roman Antiquities. She was an dedicated teacher and an outstanding scholar of Greek art and archaeology, who served as campus leader during times of great challenges to the University. 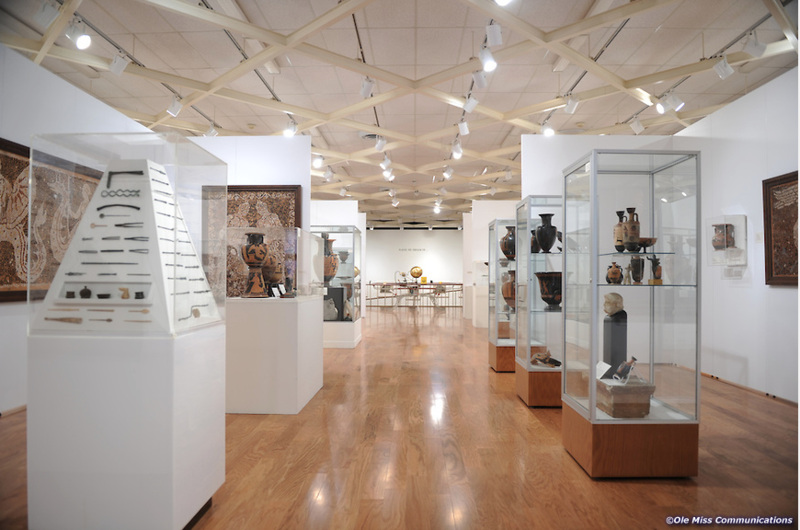 She was instrumental in the expansion of the University Museum in the 1970s, and directed the Museum for much of the 1980s. 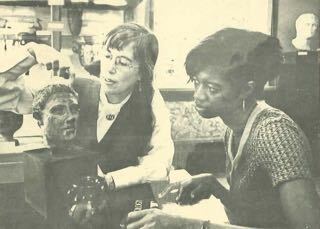 After her retirement in the early 1990s, Dr. Turnbull remained active in the Oxford community and in her church, and continued as a true colleague to us in the Department of Classics. She will be deeply and sincerely missed. In invite you to visit Dr. Turnbull's obituary and a tribute page, or to read a short piece honoring her in the 2012 College of Liberal Arts publication, View From Ventress. 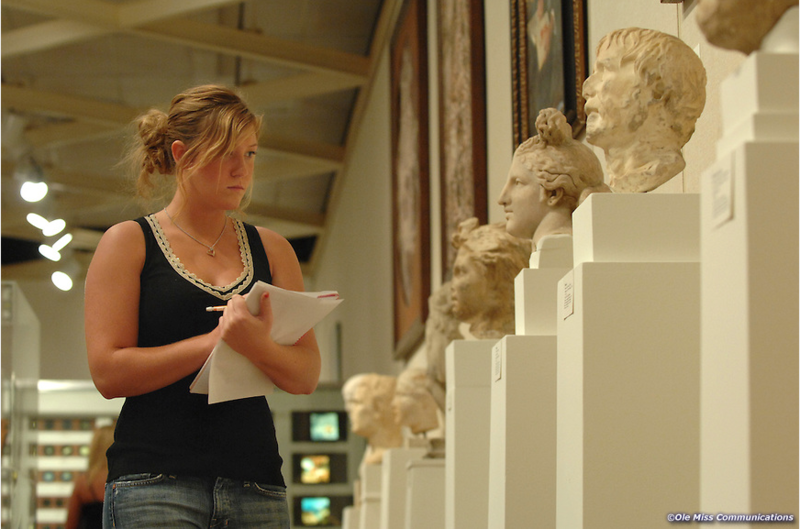 Finally, I wanted to share below an essay by Lucy "On Museums" from another University publication in 1971; this last really captures her spirit as an educator and the best kind of classicist. We are very proud to announce that the Mississippi Humanities Council has named Associate Professor of Classics Dr. Brad Cook the 2019 University of Mississippi Humanities Teacher of the Year. 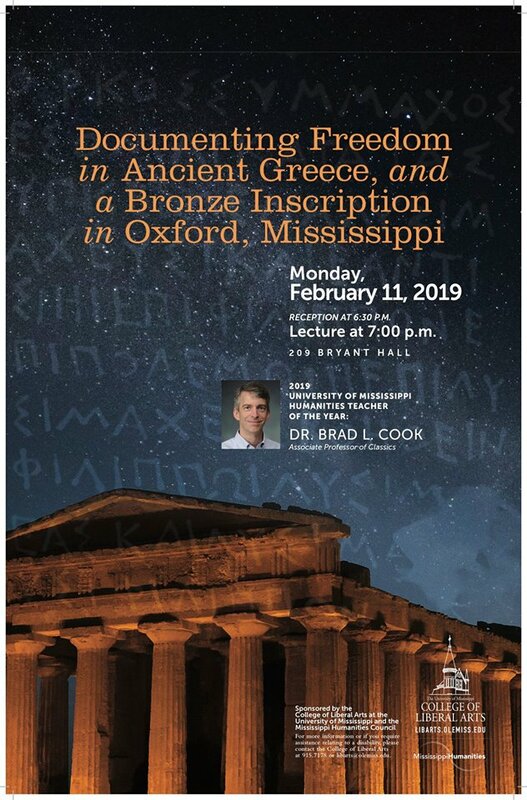 As part of the celebration of this well-deserved recognition, Dr. Cook will be presenting a public lecture on some of his current research on Monday, February 11, 2019 at 7:00 in Bryant 209. 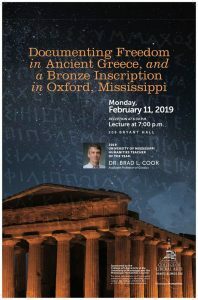 His talk, "Documenting Freedom in Ancient Greece and a Bronze Inscription in Oxford Mississippi," stems from his work with a small portable inscription in the University Museum that records the manumission of a female slave. The Department of Classics is saddened to report that our emeritus colleague Dr. Edward Capps III passed away in Oxford, MS on August 15, 2018. 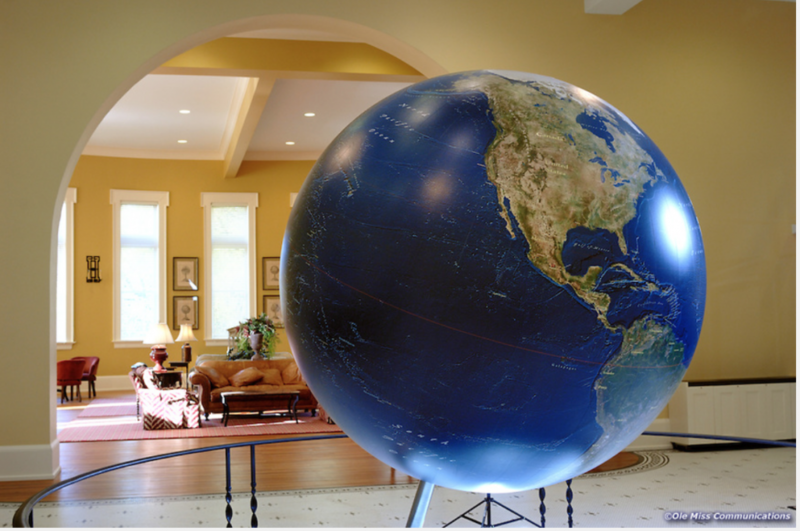 Dr. Capps was born in 1935 in Oberlin, Ohio where his father was a Professor of Classical Art at Oberlin College; his grandfather was a Professor of Classics at Princeton. 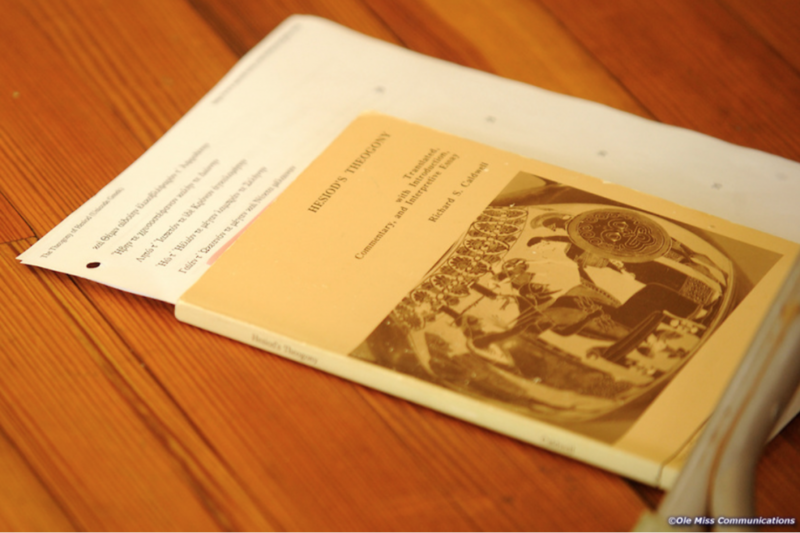 Educated at Swarthmore College and Yale, Dr. Capps joined our department in 1964 and taught ancient languages, literature, mythology and civilization courses for many years to many thousands of University of Mississippi students. From 1969 to 1972 he served as Vice-President for Mississippi in the Classical Associate of the Middle West and South. Dr. Capps retired in 2002 and was named Professor Emeritus, but continued to teach freshman liberal arts seminars for some years after that. Donations and memorials in honor of Dr. Edward Capps III, may be made to the Mississippi Public Broadcasting Foundation (www.mpbonline.org/more/support/). Assistant professor of Classics Dr. Jacqueline DiBiasie Sammons and three UM undergrads, Arianna Kitchens, Madeleine McCracken, and Mweyeria Offord spent part of Summer 2018 hard at work locating and digitally documenting graffiti in the ancient city of Herculaneum. 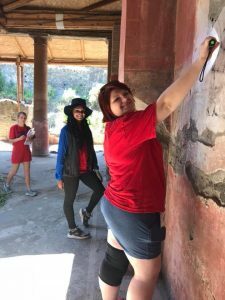 Dr. DiBiasie Sammons is the field director for the Ancient Graffiti Project and will be taking more students to continue the project's work in Pompeii in Summer 2019. The Mike and Mary McDonnell Endowment for the Study of Classics helped fund all three students' work on the project. 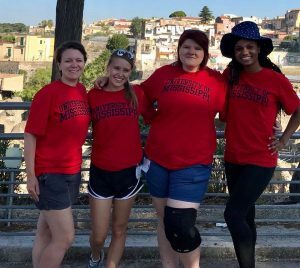 Associate Professor and Chair of Classics Dr. Molly Pasco-Pranger was awarded the College of Liberal Arts' 2018 Cora Lee Graham Award for Outstanding Teaching of Freshmen. The award was announced in May 2018. Read more here.